Our Mazda 5 Sport is currently at about 65000 miles. So far we've had a faulty solenoid valve under warranty, , replaced a motor mount under warranty, faulty fuel filler neck (not fixed), broken reverse lockout (manual transmission). No tire wear issues at all. Engine performing well - no complaints. We have an earlier Mazda5 Sport approaching 193,000 km / 120,000 miles. Very pleased with powertrain performance, but suspension poor; would hope that they have improved the suspension in the 2012 and later models. That being said we don't mind a bit of slop in the suspension and have been fixing as money becomes available. Ditto no problems with tires. Would buy again - in fact we may get a second Mazda5 if the price is right. and there is a link to the recall page. Not sure if this has any value to you but good to know mine is not under recall for anything. I have a 2010 with 186,000 miles owned since new. I have been very pleased with the car and it is a great value for the price (10k less than "true" minivans). I have the manual transmission which has been flawless other than expected clutch wear replacement at about 160,000 (quite expensive, though, since it requires pulling the engine out -- about $1,200). I have had no issue with steering but did replace both front struts (again, at over 150,000 miles so that really is expected wear and tear). Strut replacement was quick and not too expensive. Brakes are easy to deal with and I have done pad and disc replacement myself (a 1 hour task). No engine problems at all other than that motor mount others have mentioned (I think you are more or less guaranteed to have to replace it by 150k). A/C compressor went out at about 150,000 and cost about $800 all in. Body and trim are perfect and even the seats show very little wear. The car drives great (a Mazda characteristic), turns incredibly tight circle. It's not super powerful but everybody knows that (and I've had 5 people plus a dog plus a full cartop carrier on it) but it gets up to speed if you stand on it. I'm sorry to hear they have discontinued it as it fits a unique niche between sedan and minivan (we call it a megawagon or microvan). >> Ditto no problems with tires. Since I wrote that above, I have had severe tire problems due to bad front suspension. Ah, well. It still drives beautifully. We've had a 2010 Mazda 5 for three years now and have really enjoyed driving it. Mileage is presently around 50K miles. It is very nimble in traffic with a light and agile, precise feel to the car and steering - the complete opposite of a Honda Odyssey we had prior, which felt like a drunk, staggering elephant in traffic (along with more power and speed - not a good combination). Aside the smart handling, we got the Mazda 5 because it was the only "minivan" that we could find with a manual transmission (Mazda has now discontinued that option in the USA). Researching the car prior to buying one, we noted the most common problem was with suspension. Indeed ours seemed to be making odd suspension noises every now and then, as soon as the day after we bought it. But the noises were slight and hard to replicate. Now they have gotten worse, and we had the car in two shops recently to address the issue. The dealer claimed a strut had gone bad or was worn out, needing replacement. OUr trusted neighborhood foreign car shop was able to replicate the noise, but found nothing functionally wrong with the suspension or the strut (i.e. it absorbs shocks fine, does not leak oil, no loose fasteners). 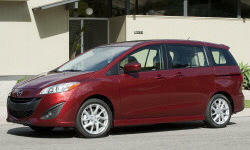 We believe now that the suspension problems of this era of Mazda 5 are a design "feature" not a "bug." The struts might just be poorly designed in that they get noisy with age. So far, the problem has not in any other way affected the functioning of the suspension: the car is smooth, handles bumps in the road well. It's just a little noisy sometimes. Tire wear appears even. Other than this noise problem, we are very happy with this car.